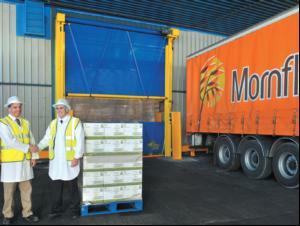 Breakfast cereal manufacturer Mornflake has installed a number of doors from Union Industries. Soon after the installation of the first Bulldoor at Mornflake's Crewe facility, the company quickly ordered a further five doors after they were impressed by the effective operation and the benefits offered in the short period of time since it was fitted. The five Bulldoors and one Matadoor have been fitted to various external and internal openings around the factory and support Mornflake's strict hygiene standards.With a 1.6 metres per second operating speed, the doors help prevent the ingress of dirt and dust as well as discouraging birds and vermin from entering the buildings. In common with the entire Matadoor Range, the doors feature Union's highly-regarded Crash-Out & Auto-Reset facility, which ensures that they remain operable if the bottom beam is hit by a speeding vehicle. This proven system, which has been on Union's doors for almost 20 years, reduces repair costs and guarantees minimal downtime. In addition, they are supplied as standard with fire-retardant and anti-static door blades and also antibacterial powder coating to the steelwork of the doors, both of which are beneficial features for all working areas, but more-so within food manufacturing environments. David Baxter, operations director from Mornflake, says: "We were instantly impressed with the first Bulldoor so we quickly identified where other Union doors could benefit the operation of our facility, and wasted no time in purchasing the other doors. The high quality of their manufacture and minimal maintenance requirements ensure that they do not reduce productivity at the factory." Neil Irwin, sales engineer at Union Industries, adds: "The Matadoor Range is very popular, especially in food manufacturing and distribution."